The Body Shop has been clearancing their nail polishes, so I couldn’t resist picking up a few more at CA$2 a pop. I’ve reviewed a few other Colour Crush Nail Polishes in the past, and they’re pretty nice polishes for the price (CA$8 but of course sales would make them about $4). 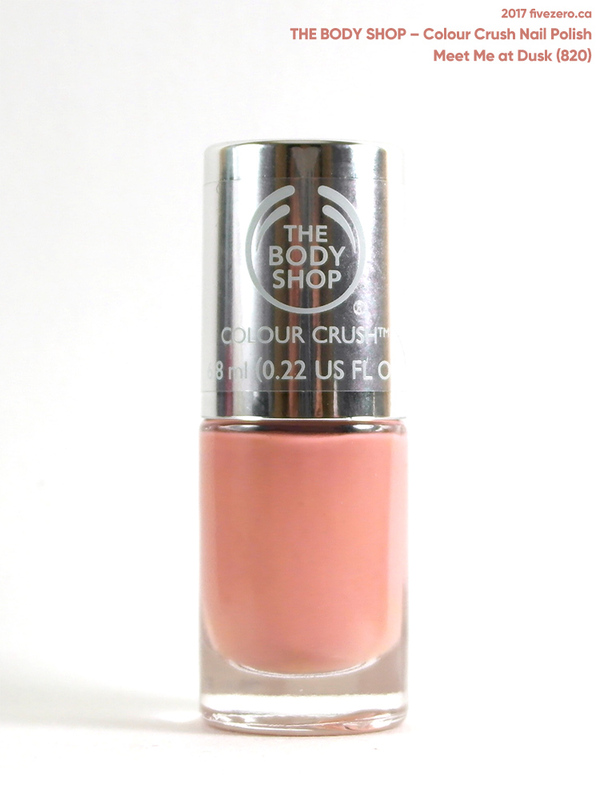 Here’s Meet Me at Dusk (820), a very conservative and office-friendly shade of soft brick rose in a cream finish. It runs warm, though it would probably still work quite nicely on cool-toned skin. My warm skintone probably makes it look a bit peachier. I’ve been AWOL for a while! Apologies—I’m sure we’ve all been terribly busy with the start of the new year, and it’s been the same for me. 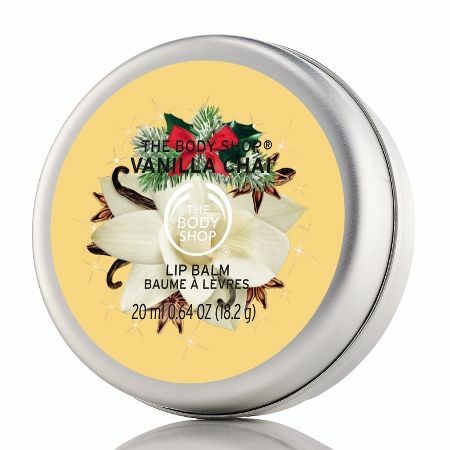 Here’s a quick post to remind you all that The Body Shop has clearanced their holiday products and (I presume) newly discontinued items, and the sales are pretty good! I know I like to complain about their products, as quite a lot I’ve tried aren’t all that great, but damn it’s hard to beat a good sale, isn’t it? And, they do have some gems here and there. I placed two orders, one yesterday and another today when they reduced some prices even more. Plus, I have the Love Your Body 10% discount, which expires in May, so I should take advantage of it as much as I can. I don’t expect to renew the card this year. Vanilla Chai is a holiday limited edition scent, and I love it! This smells to me like a sweet chai with loads of vanilla. I don’t really get the eggnog vibe that some people are talking about—I definitely get chai. I know this because last year, I ordered the Body Butter, then totally forgot what scent I ordered when I slathered it on. I instantly thought, “This smells like sweet chai!” and not, “Mmm, eggnog.” And I love eggnog. A scent for next Christmas, perhaps? I don’t like the Lip Butters I’ve tried; hopefully this one will be better since it is called Lip Balm and comes in a tin. At least I know I’ll like the scent! My finger is still healing—it’s at the scabby phase, now—so I’ve got another swatch-less review today! I deeply love a piña colada (most anything with coconut+pineapple…and rum), so I was really excited to try out The Body Shop’s new Piñita Colada line of bath and body products. The Fresh Body Sorbet sounded great—and a body moisturizer would let the scent linger more than, say, a body wash would—so that’s what I chose. Smooth on sunshine with our new limited edition Piñita Colada collection. This irresistible tropical summer scent featuring coconut and pineapple is deliciously refreshing and moisturising and offers a smile-inducing experience. Escape to the tropics with our light summer textures that are crisp and exotic, making it the perfect post-beach body care treat. Good copy, right? But I’m dismayed to report that I didn’t like this product very much at all! Firstly, the scent is not especially strong and not particularly interesting. The notes sound great, but the actual fragrance is weak and decidedly artificial smelling, not juicy at all. I’d never heard of a piñita colada before, and only figured that the word was a diminutive of piña, Spanish for pineapple—though I learned it as ananá in high school. [I just looked it up and colada must be from the same root as the English colander, as it means “strained” in Spanish.] It turns out that piñita colada refers to a virgin piña colada, even though The Body Shop’s scent pyramid does include boozy notes in the base. Have you ever paid attention to the lyrics of “Escape (The Piña Colada Song)“? !